Camille Grammer, endometrial cancer survivor, Chair of the 2015 National Race to End Women’s Cancer to be held Sunday, Nov. 8 in Washington, D.C. and one of the stars of The Real Housewives of Beverly Hills hosted a Fundraiser at her home for the Foundation for Women’s Cancer on October 2, 2015 and announced the upcoming silent auction for Once Upon A Time : Night Owl, part of the wooden sculpture series custom created for her by Lex Lumiere. The silent auction will help support cancer prevention of the yearly 30,000 mothers, sisters, friends that will die from a GYN cancer. 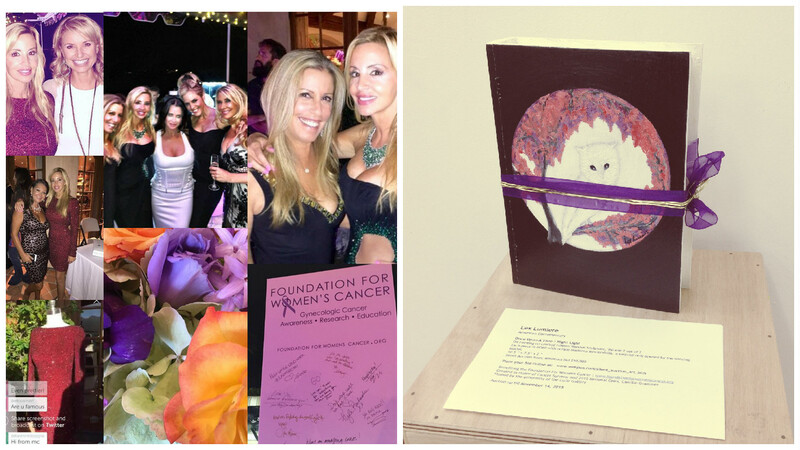 Join the movement to end womens cancer and get ready to place your bids for a great cause online or at the Laurie Gallery in Los Angeles where the artwork will be on display through November 14th, 2015.